I recently purchased cream-colored leather furniture for the living room. We have gray carpeting with flecks of colors - shades of blue and mauve. Also, what would be a good color for drapes? I really like teal blue and would like to use this color for accent pillows etc. When trying to bring together a number of items in a room, I always think finding a fabric that incorporates some or all of those colors is a good first step. It is impossible to be 100% sure on a computer screen but the fabric above seems to give us the cream and teal you already have or have chosen with the addition of silver gray and charcoal. Using this fabric (or something in a different style with the same color palette) you can start to make decisions about which colors should go where. Those decisions will really be based on your own preferences and how much color you want to add to the room. You could opt for pale silver gray on the walls with a deep charcoal gray for the curtains. Equally, cream walls with brown curtains is an option. Painting accent walls is another option and using using one of the pale colors on two or three walls and a stronger color as a feature would add interest to the room - teal for color or charcoal for drama are worth thinking about. As for the fabric itself I would suggest you think about using it to make one or two fabric wall panels or, if you prefer, a couple of accent pillow covers to go alongside the plain teal ones on the sofa. Where did you get that fabric - I love it. It is my intention to always give credit to a designer when I feature a product on this site but it seems I have overlooked doing so on this occasion - my apologies for that. 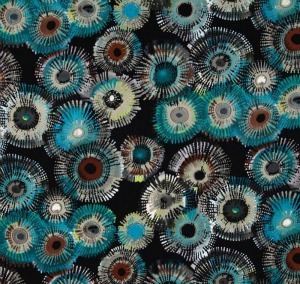 In an attempt to rectify this I have spent hours this morning trying to find this fabric but with no luck. I originally came across the fabric in February 2011 and I can only assume it has since been discontinued. If you do manage to find it, please do let me know as I would like to add the designers name to the picture if possible.